ATLANTA. April 5, 2017. Jackson Fine Art is proud to present new exhibitions from Matthew Brandt and Ruud van Empel, two contemporary artists whose works challenge preconceptions of traditional photography. Brandt is known for employing early processes that celebrate the material essence of analog photography, while van Empel’s digital composites result from the meticulous assemblage of hundreds of the artist’s own source photographs into one photorealistic image. On the evening of Friday, April 28th, from 6-8pm, we will host an opening reception with both artists in attendance. On Saturday, April 29th at 3:30pm, Ruud van Empel will give an artist’s talk at the gallery, followed by questions and a book signing. At 2pm, Matthew Brandt will speak at the Hill Auditorium for a program presented in cooperation with the High Museum. In Matthew Brandt’s work, the artist conflates subject and material, incorporating physical elements from the sources he’s depicting to create unique compositions that are technically inventive and conceptually sly. 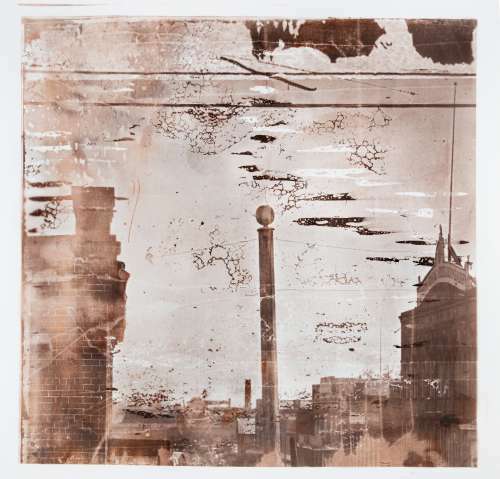 For Lakes and Reservoirs, his landscapes were bathed in the water of their subjects; 2014’s Dust featured reproductions of historical photographs of demolished structures, rendered in pigments borne of debris collected from those buildings’ contemporary sites. 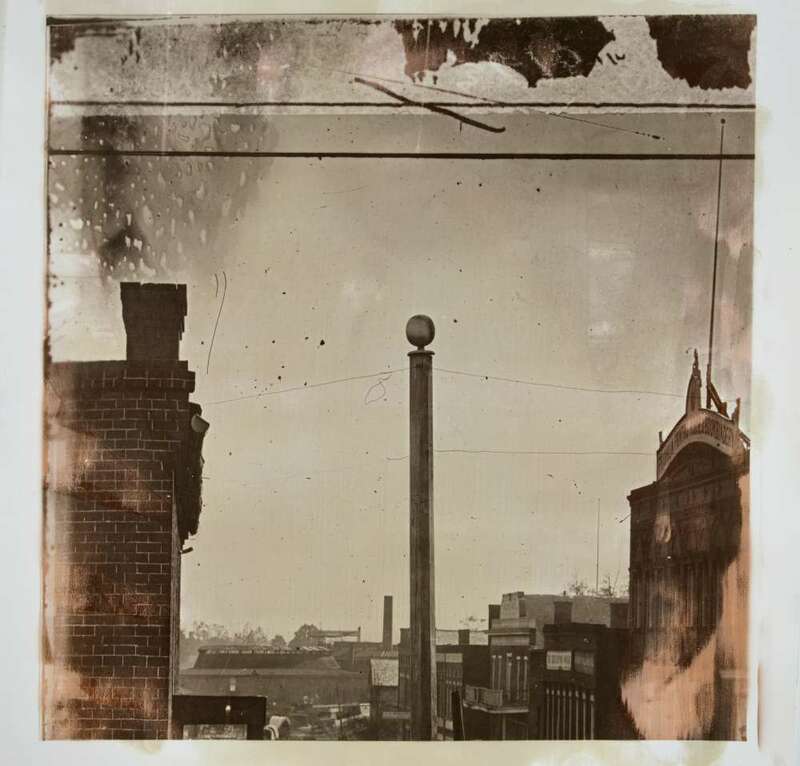 For 1864, his first exhibition at Jackson Fine Art, Brandt again turns to the archives, reinterpreting George N. Barnard’s photographs of a post-Sherman Atlanta by making images of a shattered city into peach pie. Brandt began working on 1864 in early 2017, informed by a February visit to Atlanta (his first) and a fascination with the online catalog of the Atlanta Journal Constitution. Fortifying the foundational ingredients of the 19th-century albumen print — egg whites, silver nitrate, and salt — with peaches, sugar, flour, cinnamon, and butter, Brandt plays with external assumptions about the South, at the same time evincing a complex understanding of the history his project excavates. Georgia’s reputation as the Peach State, now tenuous, calcified in the three decades following the Civil War. Brandt’s large scale photographs of the ruins of Union Depot, once situated between Pryor Street and Central Avenue, or Confederate Peachtree Street (then Whitehall), compress time, creating a symbolic conversation at turns funny and reverent, and loaded with unexpected associations. 1864’s landscapes will be exhibited alongside a series of still life peaches. These photographs were processed with the same recipe (see below) as the Barnard images, but composed using Styrofoam fruit made in China and purchased from eBay, in a gesture that situates the project squarely in the present. Ruud van Empel’s striking large-format photomontages apply painterly precision and detail to a medium often derided in contemporary fine art photography — the digital composite. 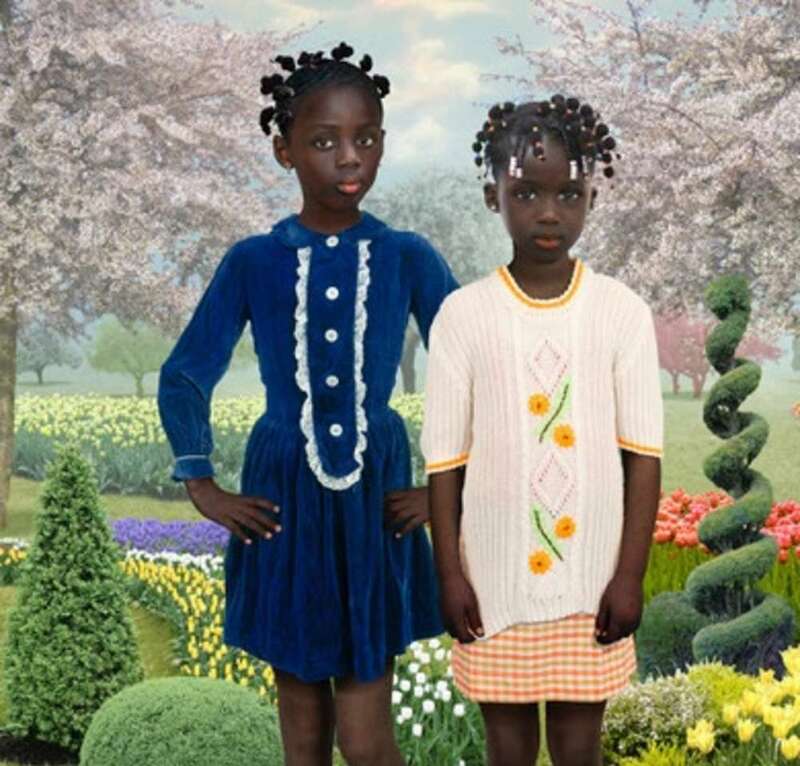 His youthful subjects and lush settings do not exist outside of van Empel’s Photoshop workspace, where the artist utilizes his own photographs of models in different settings and a large collection of images he has collected over time to create complex portraits of startling realism, marked by a tinge of the uncanny. In World, van Empel depicted innocent subjects adrift in elaborate natural settings, evoking magical realism and the pastoral children’s portraits of the German painter Otto Dix. Portraits, van Empel’s third exhibition at Jackson Fine Art, draws on two new series for which van Empel shifts away from the straightforward fantasy of earlier bodies of work in favor of a psychological contemplation of his subjects. Mood and Analogy recall van Empel’s Dutch artistic heritage through clasically posed portraits reminiscent of painted miniatures and distinguished by dark, earthy tones and dramatic chiarrascuro. Van Empel’s young inventions appear not lost in the world, but living in it, with all of the complexity and depth that entails. About Matthew Brandt Work by Matthew Brandt (b. 1982) is in the permanent collections of Metropolitan Museum of Art, New York; National Gallery of Art, Washington, DC; J. Paul Getty Museum, Los Angeles; Brooklyn Museum, New York; Art Gallery of South Wales, Sydney, Australia; Virginia Museum of Fine Arts, Richmond; Cincinnati Art Museum; Los Angeles County Museum of Art; Hammer Museum, Los Angeles; Royal Danish Library, National Museum of Photography, Copenhagen; and the Columbus Museum of Art, among others. Matthew Brandt was one of seven artists featured in the 2015 exhibition at the J. Paul Getty Museum, Los Angeles, Light, Paper, Process: Reinventing Photography. A solo exhibition of his work, Sticky/Dusty/Wet, was presented by the Columbus Museum of Art and traveled to the Virginia Museum of Contemporary Art in 2014. Brandt's first monograph, Lakes and Reservoirs, co-published by Damiani and Yossi Milo Gallery, was released in Fall 2014. Brandt was born in California. He received his BFA from The Cooper Union in New York and his MFA from UCLA. He currently lives and works in Los Angeles. About Ruud van Empel Ruud van Empel (b. 1958) is a contemporary Dutch artist who was recently recognized as ‘Artist of the Year 2017’ by the American Friends of Museums in Israel. Born in Breda, the Netherlands, he went on to study at the Academie St. Joost and initially work in commercial graphic design and videography. Van Empel’s work is collected by numerous institutions worldwide, such as the C-Photo Collection in London, the Chaney Collection in Houston, the George Eastman House in Rochester, the Tel Aviv Museum of Art, the Joods Historisch Museum in Amsterdam, the Sir Elton John Photography Collection, MoPA Museum of Photographic Arts in San Diego, and the Alturas Foundation in San Antonio. He is also the recipient of several awards, including the Municipality of Breda Oevre Award in 2013. Van Empel currently works and lives in Amsterdam, the Netherlands. Contact To arrange interviews with Ruud van Empel or Matthew Brandt, and to request high resolution images, please contact Coco Conroy: coco@jacksonfineart.com. Jackson Fine Art is located at 3115 East Shadowlawn Ave. NE, Atlanta, GA 30305. For more information about Jackson Fine Art and our artists, visit jacksonfineart.com. Talk: Matthew Brandt Saturday, April 29th from 2-3pm at the Hill Auditorium at the Woodruff Arts Center. Reservations required. Tickets are free for members and $14.50 for not-yet-members, which includes High Museum Admission. Visit www.high.org or call 404.733.5000 for more information. ------------------------------------------------------------------------------------------------------------------------------- MATTHEW BRANDT’S PEACH PIE Ingredients used: -Peaches (I used canned peaches, but fresh peaches should also work) -eggs -salt -sugar -flour -cinnamon -butter -silver nitrate Mix all of the ingredients (excluding the silver nitrate) in a large bucket. Thoroughly blend in mixer for at least 1 hour. Once all is thoroughly mixed, cover in plastic and let sit in refrigerator for at least 1 day. Pour mixture in large tray slightly bigger than paper size. Take paper and float on top of peach pie mixture for 5 minutes. Then hang to dry overnight. Repeat previous process for double coating. Additional coating is optional. Once mixture has been evenly coated on paper, in safe darkroom light, coat sheet in silver nitrate. A brush can be used with the silver nitrate or the same float process can also be used. Once silver nitrate has dried, take negative and expose paper to UV light. After exposure, thoroughly rinse off print and bring to fixer and let sit. Repeat previous step in additional fixer tray. Once fixed, bring to clean water and rinse and rinse and rinse. Hang to dry. Prints will be curled, heat press to flatten. Hang and enjoy.